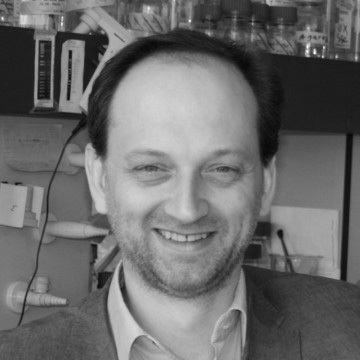 Our work investigates the signalling processes and neuronal populations in the central nervous system that regulate energy homeostasis and their contribution to diseases such as obesity and type II diabetes. We have shown that signalling pathways, such as those recruited by insulin, regulate both energy homeostasis and longevity and healthspan. We also use optogenetic, chemogenetic and in vivo imaging approaches to map the brain circuits involved in feeding and other related behaviours. These studies have revealed that the dynamic activities of defined neuronal populations integrate food intake, metabolism and complex motivated behaviours. Our goal is to identify the cellular and physiological mechanisms that control energy balance and understand how such processes are involved in the pathogenesis of metabolic and age-related disease. 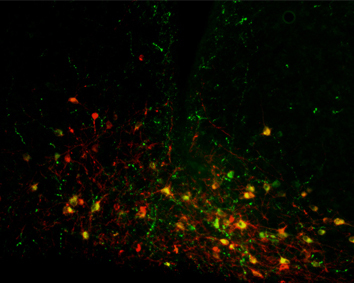 A coronal section through the arcuate nucleus of the hypothalamus showing pro-opiomelanocortin (POMC) neurons expressing green fluorescent protein transduced with an adenovirus expressing channelrhodopsin and mCherry (red). POMC neurons co-expressing the virus appear yellow. Rached M-T, Millership SJ, Pedroni SMA, Choudhury AI, Costa ASH, Hardy DG, Glegola JA, Irvine EE, Selman C, Woodberry MC, Yadav VK, Khadayte S, Vidal-Puig A, Virtue S, Frezza C, Withers DJ. (2019). Deletion of myeloid IRS2 enhances adipose tissue sympathetic nerve function and limits obesity. Molecular Metabolism, 20, 38-50. Millership SJ, Tunster SJ, Van de Pette M, Choudhury AI, Irvine EE, Christian M, Fisher AG, John RM, Scott J, Withers DJ. (2018). Neuronatin deletion causes postnatal growth restriction and adult obesity in 129S2/SV mice. Molecular Metabolism, 18, 97-106. Smith MA, Katsouri L, Virtue S, Chouhury AI, Vidal-Puig A, Ashford MLJ, Wither DJ. (2018). Calcium channel Ca(v)2.3 subunits regulate hepatic glucose production by modulating leptin-induced excitation of arcuate pro-opiomelanocortin neurons. Cell Reports, 25(2), 278-287. Millership SJ, Da Silva Xavier G, Choudhury AI, Bertazzo S, Chabosseau P Pedroni SM, Irvine EE, Montoya A, Faull P, Taylor WR, Kerr-Conte J, Pattou F, Ferrer J, Christian M, John RM, Latreille M, Liu M1 Rutter GA, Scott J, Withers DJ. (2018). Neuronatin regulates pancreatic β cell insulin content and secretion. J Clin Invest 1, 128(8), 3369-3381. doi: 10.1172/JCI120115. Viskaitis P, Irvine EE, Smith MA, Choudhury AI, Alvarez-Curto E, Glegola JA, Hardy DG, Pedroni SMA, Paiva Pessoa MR, Fernando ABP, Katsouri L, Sardini A, Ungless MA, Milligan G, Withers DJ. (2017). Modulation of SF1 Neuron Activity Coordinately Regulates Both Feeding Behavior and Associated Emotional States. Cell reports 21(12), 3559-3572. Smith MA, Katsouri L, Irvine EE, Hankir MK, Pedroni SM, Voshol PJ, Gordon MW, Choudhury AI, Woods A, Vidal-Puig A, Carling D, Withers DJ. (2015). Ribosomal S6K1 in POMC and AgRP Neurons Regulates Glucose Homeostasis but Not Feeding Behavior in Mice. Cell reports 11(3), 335-343. Karra E, Owen G. O’Daly OG, Choudhury AI, Yousseif A, Millership S, Neary MT, Scott WR, Chandarana K, Manning S, Hess ME, Iwakura H, Akamizu T, Millet Q, Gelegen C, Drew ME, Rahman S, Emmanuel JJ, Williams SCR, Rüther UU, Brüning JC, Withers DJ, Zelaya FO, Batterham RL. (2013). A link between FTO, ghrelin, and impaired brain food-cue responsivity. The Journal of clinical investigation 123(8), 3539-3551. Claret M, Smith MA, Knauf C, Al-Qassab H, Woods A, Heslegrave A, Piipari K, Emmanuel JJ, Colom A, Valet P, Cani PD, Begum G, White A, Mucket P, Peters M, Mizuno K, Batterham RL, Giese KP, Ashworth A, Burcelin R, Ashford ML, Carling D, Withers DJ. (2011). Deletion of lkb1 in pro-opiomelanocortin neurons impairs peripheral glucose homeostasis in mice. Diabetes 60(3), 735–745. Selman C, Tullet JM, Wieser D, Irvine E, Lingard SJ, Choudhury AI, Claret M, Al-Qassab H, Carmignac D, Ramadani F, Woods A, Robinson IC, Schuster E, Batterham RL, Kozma SC, Thomas G, Carling D, Okkenhaug K, Thornton JM, Partridge L, Gems D, Withers DJ. (2009). Ribosomal protein s6 kinase 1 signaling regulates mammalian life span. Science 326(5949), 140–144.